EARTH is poorly named. The ocean covers almost three-quarters of the planet. It is divided into five basins: the Pacific, the Atlantic, the Indian, the Arctic and the Southern oceans. Were all the planet’s water placed over the United States, it would form a column of liquid 132km tall. The ocean provides 3bn people with almost a fifth of their protein (making fish a bigger source of the stuff than beef). Fishing and aquaculture assure the livelihoods of one in ten of the world’s people. Climate and weather systems depend on the temperature patterns of the ocean and its interactions with the atmosphere. If anything ought to be too big to fail, it is the ocean. Humans have long assumed that the ocean’s size allowed them to put anything they wanted into it and to take anything they wanted out. Changing temperatures and chemistry, overfishing and pollution have stressed its ecosystems for decades. The ocean stores more than nine-tenths of the heat trapped on Earth by greenhouse-gas emissions. Coral reefs are suffering as a result; scientists expect almost all corals to be gone by 2050. By the middle of the century the ocean could contain more plastic than fish by weight. Ground down into tiny pieces, it is eaten by fish and then by people, with uncertain effects on human health. Appetite for fish grows nevertheless: almost 90% of stocks are fished either at or beyond their sustainable limits (see Briefing). The ocean nurtures humanity. Humanity treats it with contempt. Such self-destructive behaviour demands explanation. Three reasons for it stand out. One is geography. The bulk of the ocean is beyond the horizon and below the waterline. The damage being done to its health is visible in a few liminal places—the Great Barrier Reef, say, or the oyster farms of Washington state. But for the most part, the sea is out of sight and out of mind. It is telling that there is only a single fleeting reference to the ocean in the Paris agreement on climate change. A second problem is governance. The ocean is subject to a patchwork of laws and agreements. Enforcement is hard and incentives are often misaligned. Waters outside national jurisdictions—the high seas—are a global commons. Without defined property rights or a community invested in their upkeep, the interests of individual actors in exploiting such areas win out over the collective interest in husbanding them. Fish are particularly tricky because they move. Why observe quotas if you think your neighbour can haul in catches with impunity? Third, the ocean is a victim of other, bigger processes. The emission of greenhouse gases into the atmosphere is changing the marine environment along with the rest of the planet. The ocean has warmed by 0.7°C since the 19th century, damaging corals and encouraging organisms to migrate towards the poles in search of cooler waters. Greater concentrations of carbon dioxide in the water are making it more acidic. That tends to harm creatures such as crabs and oysters, whose calcium carbonate shells suffer as marine chemistry alters. Some of these problems are easier to deal with than others. “Ocean blindness” can be cured by access to information. And indeed, improvements in computing power, satellite imaging and drones are bringing the ocean into better view than ever before. Work is under way to map the sea floor in detail using sonar technology. On the surface, aquatic drones can get to remote, stormy places at a far smaller cost than manned vessels. From above, ocean-colour radiometry is improving understanding of how phytoplankton, simple organisms that support marine food chains, move and thrive. 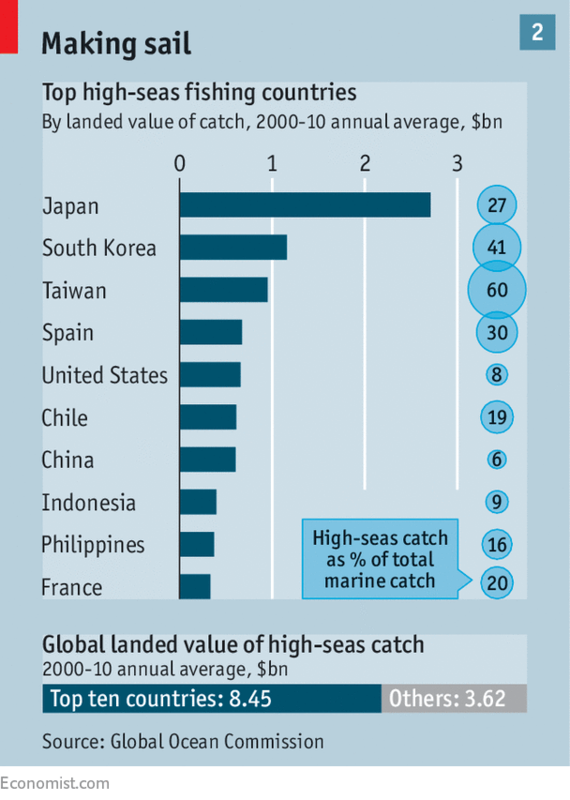 Tiny satellites, weighing 1-10kg, are enhancing scrutiny of fishing vessels. Transparency can also mitigate the second difficulty, of ocean governance. More scientific data ought to improve the oversight of nascent industries. As sea-floor soundings proliferate, the supervision of deep-sea mining, which is overseen by the International Seabed Authority in areas beyond national jurisdiction, should get better. More data and analysis also make it easier to police existing agreements. Satellite monitoring can provide clues to illegal fishing activity: craft that switch off their tracking devices when they approach a marine protected area excite suspicion, for example. Such data make it easier to enforce codes like the Port State Measures Agreement, which requires foreign vessels to submit to inspections at any port of call and requires port states to share information on any suspected wrongdoing they find. Clearer information may also help align incentives and allow private capital to reward good behaviour. Insurance firms, for instance, have an incentive to ask for more data on fishing vessels; if ships switch off their tracking systems, the chances of collisions rise, and so do premiums. Greater traceability gives consumers who are concerned about fish a way to press seafood firms into behaving responsibly. Thanks to technology, the ocean’s expanse and remoteness are becoming less formidable—and less of an excuse for inaction. A UN meeting on the ocean next month in New York is a sign that policymakers are paying more attention to the state of the marine realm. But superior information does not solve the fundamental problem of allocating and enforcing property rights and responsibilities for the high seas. And the effectiveness of incentives to take care of the ocean varies. Commercial pay-offs from giving fish stocks time to recover, for example, are large and well-documented; but the rewards that accrue from removing plastic from the high seas are unclear. Above all, better measurement of global warming’s effect on the ocean does not make a solution any easier. The Paris agreement is the single best hope for protecting the ocean and its resources. But America is not strongly committed to the deal; it may even pull out. And the limits agreed on in Paris will not prevent sea levels from rising and corals from bleaching. Indeed, unless they are drastically strengthened, both problems risk getting much worse. 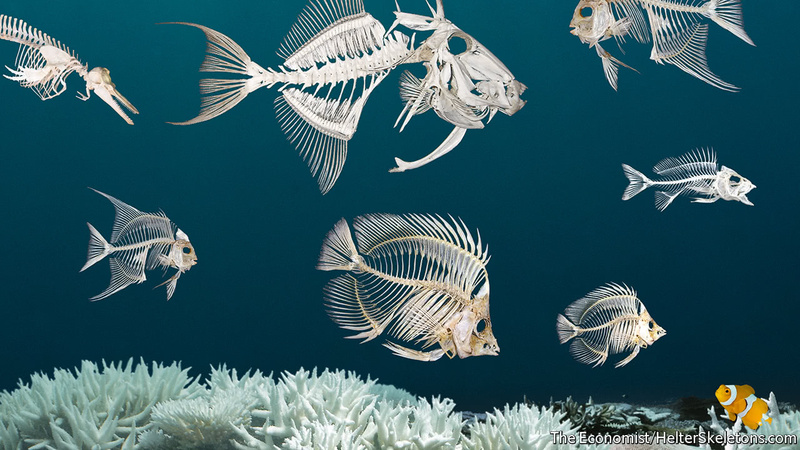 Mankind is increasingly able to see the damage it is doing to the ocean. Whether it can stop it is another question. In 2013, the most recent year for which full data are available, 32% of the world’s fish stocks were being exploited beyond their sustainable limit, up from 10% in the 1970s, according to the UN’s Food and Agriculture Organisation. The amount of fish caught at sea has been pretty much flat for the past three decades, but the share of the world’s fish stocks that are being plundered unsustainably has continued to increase (see chart 1). Not all the harm comes directly from the land; some comes via the sky. Carbon dioxide accumulating in the atmosphere has so far raised the world’s average sea-surface temperature by about 0.7ºC. This has effects at depth; when seas warm up they become more stratified, making it harder for nutrients in the waters below to rise to where they are most needed by fish and plankton. Given this, it might seem fortunate that the ocean absorbs a fair bit of that carbon dioxide, thus reducing the warming. But doing so changes the ocean’s chemistry, making it more acidic. This is a particular problem for creatures with calcium-carbonate shells—which includes not just crabs and oysters but quite a lot of larvae, too. Acidification makes carbonates more likely to dissolve. It is hard to grasp the scale of such planetary changes, and impossible to say how much damage they will do. That is the way of things with the ocean; it is vast and human horizons are close. That something so immense could be put at risk just by people leading their daily lives seems inconceivable. But as with the atmosphere and the surface of the continents—where humans now move more sediments than the natural processes of erosion—the fact that something is vast does not mean humans cannot have profound impacts on it. For the sake of the hundreds of millions of people who depend on the ocean for livelihoods or sustenance, as well as for the sake of the ocean itself, these human impacts need to be reined in. There are signs that, where fishing is concerned, this may be coming about, not least because monitoring what goes on over the horizon is becoming ever easier. But there is a great deal left to do. 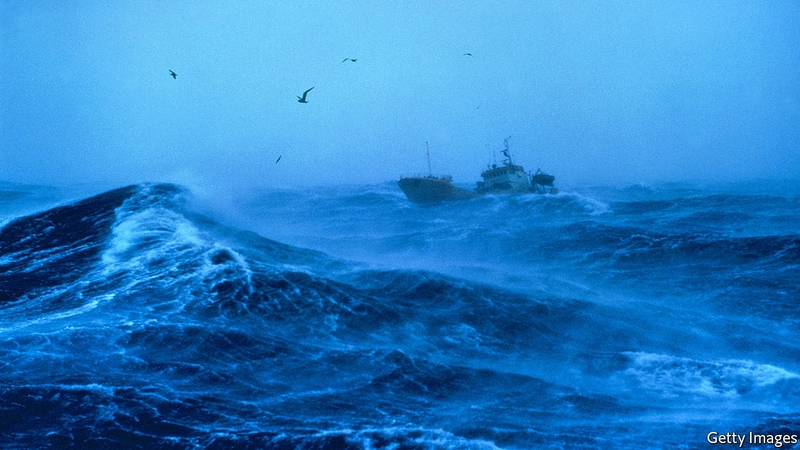 Overfishing is bad for fish; it is also, in the long run, bad for those seeking to catch them. The goal of sound management is to have a stock that is harvested at the same rate that it replenishes itself—which might typically be a stock about half the size of what would be there if there were no fishing at all. If fishers take more than this “maximum sustainable yield”—as they do in many fisheries today—then in the long run they will get less out of the resource than they could, quite possibly imperilling its future. If stocks were allowed to rise back up far enough for the world’s fisheries to reach their maximum sustainable yield, the industry would increase production by 16.5m tonnes—about a fifth of the current total—and bring in an extra $32bn a year. Good management could in principle get the stocks back up through the use of quotas, property rights and other constraints on untrammelled exploitation. Quotas and similar controls have worked well in some cases. 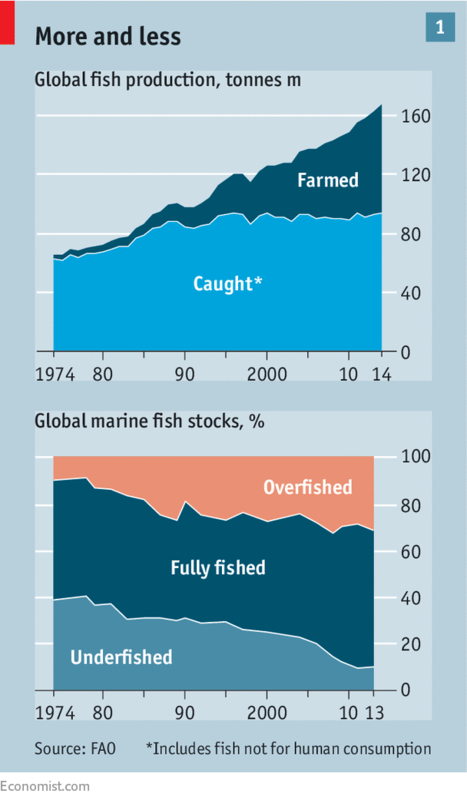 In American waters 16% of stocks were overfished in 2015, down from 25% in 2000. But they have drawbacks. Because they want to land the largest fish they can find, fishers throw back undersized specimens, which often die as a result. And because fish mix, species caught by accident are thrown back if a fisher has no quota for them. Quotas are also often badly set. Regulators and politicians pander too much to powerful fishing interests, according to Rainer Froese of the Helmholtz Centre for Ocean Research in Kiel, Germany. Lobbies, which often benefit from the importance of fishing to specific places, push for short-term profit over long-term sustainability. “They harvest the apples by cutting the tree branches,” says Mr Froese. The problem is exacerbated by a lack of evidence, which makes overly permissive quota-setting easier. More investment in research and monitoring could help. But in developing countries, where the need is often dire, there are frequently no resources to meet that need, and in many rich countries fishing is not a big enough industry to make such research a national priority. “We are not good value for the taxpayer, but how can you have an island nation without a fishing fleet?” asks Pete Bromley, a former fisherman who is now master of Sutton Harbour. Aquaculture boosters might answer that fleets are simply no longer needed. But farmed fish, particularly salmon and their ilk, are fed on smaller fish that themselves are caught at sea. Insects or algae might provide alternative fodder, but the companies involved are slow to embrace such novelties, according to Ari Jadwin of AquaSelect, which provides advice to Chinese fish farms. One issue, he says, is that Chinese consumers are not moved by sustainability arguments. But he thinks that concerns over food safety will lead to better practices in the long run. Those struggling to make money from early mornings in stormy seas worry more about business in the next year than in the next fifty. “Climate change isn’t happening next month. At the moment we’ve got to hang on to what we’ve got,” says Mr Bromley. But worrying trends are already visible. As equatorial seas warm up, many plankton species are extending their range towards the poles by hundreds of kilometres a decade; where they lead, fish will follow. Moving somewhere cooler might seem a simple thing; but temperature is not all that matters to fish, and so there can be trade-offs involved. The flounders off the coast of Britain like water that is both relatively shallow and fairly cool, says Martin Genner from the University of Bristol. With water temperatures around the south of the country 1.5ºC higher than they used to be, the flounders have headed north—but there the waters are deeper, which suits them less well. Fish may also need particular types of food at particular times in their life cycles, such as when their larvae hatch. If predators and prey respond to warming by heading to different places, or by speeding up or slowing down their breeding at different paces, such needs will go unmet. But how much, and where, food webs will be thus disrupted is hard to say. Few of the models seeking to predict how climate change will affect fish consider ecological interactions between species. Not everything in the sea can move to waters new with the flick of a fin. Coral reefs, for example, are rather stuck. Although they cover less than a thousandth of the world’s sea floors, they support a quarter of known marine species—and through them millions of people who rely on fishing and tourism for their livelihoods. As oceans warm, corals risk “bleaching”—losing their colourful algal symbionts—because the algae involved can only survive in a slim range of temperatures. Without their algae, which photosynthesise, the corals lose their source of energy. Acidification makes the picture worse. Though it is hard to distinguish the effects of chemistry from the other problems that beset reefs, it seems a fair bet that an environment where calcium carbonate is more likely to dissolve will not be good for them. A study published last year by researchers at the Carnegie Institution for Science made the point clearly by running de-acidified water over a reef; the corals perked up nicely. Doing the same for all the world’s reefs, though, is hardly an option. 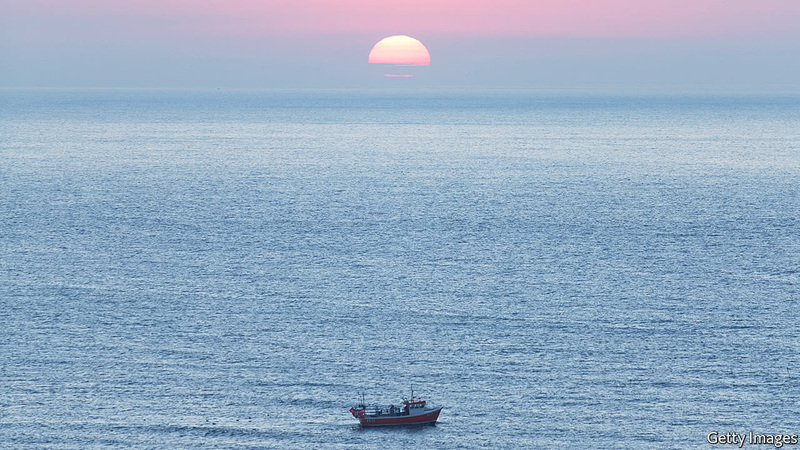 Faced with chronic problems and hard-to-quantify future crises, the sea’s resources need to be looked after better by all those—countries, consumers, companies and fishers—with a stake in their survival. Much of that needs to be done in national jurisdictions. Though overfishing means that many fleets now head farther from home than before, about 90% of the catch is from the “exclusive economic zones” (EEZs) that countries are entitled to claim out to as far as 200 nautical miles (370km) from their shores. 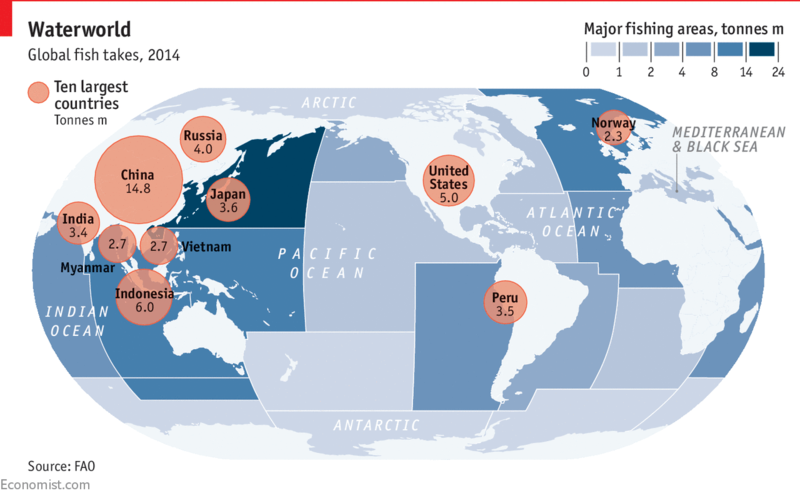 What counts as a shore, and a claim, though, can be disputed: China’s assertion of fishing rights in the South China Sea, which contains a tenth of the global fish catch, sets its neighbours on edge (though it is hardly the only thing that does). Russia, America and other Arctic states argue over new access to fish stocks in the melting north. Though what goes on in EEZs is largely a sovereign matter, there are some levers available to outsiders. The World Trade Organisation (WTO) hopes to introduce new rules on fishing subsidies at its next ministerial jamboree in December. These come to $30bn a year, with seven in every ten dollars handed out by comfortably-off countries. The WTO first started discussions on fishing subsidies back in 2001; Pascal Lamy, formerly its director-general, says a great deal of effort has gone into working out which subsidies are contributing to harmful fishing practices. The reckoning now is about 60% of them do so. China, which gets far more fish from its EEZ than any other country does from theirs (as well as fishing, by agreement, the EEZs of other countries), seems open to action on subsidies if some unrelated anti-dumping measures are loosened. But how to bring poor countries on board remains a thorny issue. Although coastal African states want change, many inland ones fret over the higher cost of fish. “The whole point is to make fish more expensive,” explains Mr Lamy, “so as to internalise the cost of environmental depletion.” Sensible stewardship, but not necessarily an easy sell in countries where fish from elsewhere are a cheap source of protein for the poor. Establishing more protected areas both within EEZs and on the high seas beyond would be another way to help, particularly if they were to contain “no-take” zones where fishing is completely barred. Such zones provide breathing spaces, or breeding spaces, in which stocks can recover. Crow White from California Polytechnic State University and Christopher Costello from the University of California, Santa Barbara have calculated that if such an approach was taken to its extreme and the high seas were closed to fishing, then yields elsewhere could rise by 30%, with fisheries’ profits doubling because fish closer to shore become cheaper to catch. The countries that dominate fishing in international waters (see chart 2) would never stomach such a ban; they prefer the often inadequate regulation offered by regional fisheries-management organisations. But even in these regimes, temporary and rolling closures have been tested. In the Antarctic permanent ones have proved successful. Spotting boats that misbehave on the high seas (or indeed in EEZs) is getting easier. The International Maritime Organisation (IMO) requires ships over 300 tonnes to have an Automatic Identification System (AIS), a radio transmitter which tells anyone in the vicinity the boat’s position, speed and identity so as to avoid collisions. “In the vicinity”, though, now includes “up above”; various satellites can use AIS transmissions to track ships. Spire, an American startup, is building up a constellation of tiny spacecraft with which it hopes to log 10m AIS transmissions every day by the end of this year. Global Fishing Watch, an online platform created by Google, Oceana, a marine charity, and Sky Truth, which uses satellite data to further environmental causes, is a keen user of AIS transmissions. They do not just let it locate fishing vessels; they let it take a good guess as to what they are doing (boats long-lining for tuna, for example, zigzag distinctively). The platform currently follows 60,000 vessels responsible for 50-60% of the world’s catch, according to Brian Sullivan from Google. Indonesia is planning to use the platform to make public data that it gathers through “vessel monitoring systems”—information which can reveal more about what is actually happening on-board than AIS location data do, and as a result is often jealously guarded. The more other countries follow suit, the better the picture will be. The Port State Measures Agreement, which came into force in 2016, means that if such monitoring leads a country to suspect that a foreign vessel is doing something dodgy, it does not have to go out and inspect it in order to take action. The agreement’s clever construction means that poor countries without much by way of navy or coastguard can deny a suspicious foreign vessel entry to their ports and pass its details on to other countries that might have the wherewithal to check it out. Companies can act, as well as countries. Food suppliers and retailers such as Costco, Sodexo and Walmart are trying to combat poor fishing practices through a body called the Seafood Task Force. The idea is to ensure that supply chains are what they purport to be and that labour conditions in the industry are up to snuff with an eye to fixing problems before they become scandals. And insurers are interested in the sort of monitoring Global Fishing Watch does: ships that turn their AIS off increase the risk of collisions; they may attract bigger premiums or have their policies revoked. Investors currently have little information on how their choice of investment affects marine life. Fish Tracker, a not-for-profit firm, aims to put that right. It is looking at the risks posed by unsustainable fishing in the same way that climate activists have studied the risks of fossil-fuel investments in order to warn off investors. Mark Campanale, the initiative’s founder, says that at the most basic level investors need to understand that if one boat catches one fish, ten boats will not catch ten. To that end the outfit is analysing information covering 300 fishing companies with a market capitalisation of $530bn to calculate the unacknowledged downsides imposed by environmental limits. None of this can drive change effectively, though, without the support of fishers. Including them in the design of regulatory regimes can bolster scientific analysis and reduce political tensions; by bringing them into the process it also deepens their understanding of sustainable practice. “It would be unacceptable for farmers to go through an educational system without understanding crop yields and the need to manage the land for future generations,” says Jim Masters of Fishing into the Future, a charity. “But there are no equivalent opportunities for fishermen.” For the sake of the fish, there should be.